Our Capsule USB drive with logo is a handy little capsule shaped USB drive for you to store all your computer data. All our USB Flash Drives come in all sizes and various different shaped styles. All with plenty of room to carry your business details and company logo for around the clock advertising. 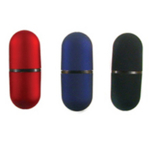 So why not give away our Capsule USB drive with logo to your customers as a promotional or Christmas giveaway, your customers will be thrilled, encouraging repeat business and customer loyalty.